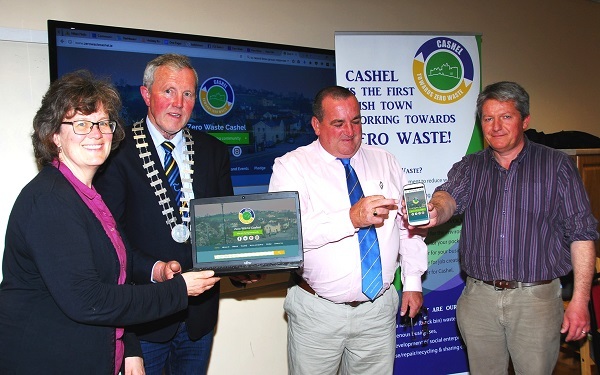 Our new website has been launched to aid the town of Cashel on its journey towards Zero Waste. The new website www.zerowastecashel.ie was launched by Cllr. Roger Kennedy, Cathaoirleach- Cashel/Tipperary Municipal District on Thursday 27th April in Spafield Family Resource Centre, Cashel. Representatives of several community groups were in attendance on the day along with representatives from The Southern Region Waste Management Office and the EPA. Visitors to the site can learn more about the initiative and keep up to date with the latest news and events that are happening. The new website has a feature that allows people to join the Cashel sharing community whereby items that are no longer needed or that can be shared can be advertised freely on the site. Visitors are also encouraged to take the ‘Zero Waste Pledge’. The pledge gives a small list of changes in consumer behaviour that anyone can easily implement. Simple changes involve such things as avoiding buying products with excessive packaging, using reusable water bottles and coffee cups, buying second hand or simply repairing items. Visitors can also subscribe to the Zero Waste Cashel e-newsletter and have all the latest news and events delivered directly to their inbox. Following feedback from focus groups that were held on the same day an action plan is now being put in place to deliver a number of workshops, seminars and education initiatives to advance the project. Details of these will be included in future e-newsletters. The Zero Waste Cashel project is being led by environmental charity VOICE, funded by the Environmental Protection Agency (EPA) and supported by the Southern Region Waste Management Office and Tipperary County Council.